Henri Gaston Busignies was born 29 December 1905 in Soeaux, France. He became a ham radio operator as a boy, but found the equipment itself more interesting than receiving faraway signals. Busignies attended Jules Ferry College in Versailles, and completed his degree in electrical engineering at the Institute Normal Electro Technique in 1926. By 1928 he was working for ITT’s Paris Labs working on radio direction finders, airplane radio navigation and early radar equipment. With the fall of Paris to Hitler, in 1940, there was a scramble to keep the electronic work that was being done by the ITT Paris Laboratory for the French military away from the Germans. Drawings and laboratory notebooks were hidden and the working models of direction finders, aerial navigation equipment, and radars were disassembled and the parts dispersed. Busignies and the other Laboratory personnel tried to assume the guise of scientists engaged in general research. But Busignies was confronted by a Luftwaffe colonel who recognized him in an elevator, expressed interest in learning of Busignies' current activities, and suggested that they should have dinner together that very evening. Luckily he was able to deflect the invitation, and ITT executives in New York arranged to smuggle their top researchers out of occupied France to the US. Busignies was one of the first three top men tapped for the escape via a secret rendezvous in Lyon in unoccupied France; then to Algiers, Rabat, Tangier - all in North Africa, and Lisbon, Portugal. Finally, by ship the three men and their families would arrive in the U.S. At the risk of their lives, the French scientists decided that they would clandestinely take their equipment with them, equipment that allowed rapid development of, according to Hitler himself, the "one single technical invention," that caused the German U-boats to lose the Battle of the Atlantic. In the U.S., Busignies developed for the U.S. Navy a shore and a ship High Frequency Direction Finder that the Navy named Huff Duff. This was the technology which was officially credited as a great factor in winning of the Battle of the Atlantic against German submarines. He received for this the Presidential Certificate of Merit from Harry Truman, a Certificate of Commendation from the U.S. Navy and many other honors and honorary doctoral degrees. 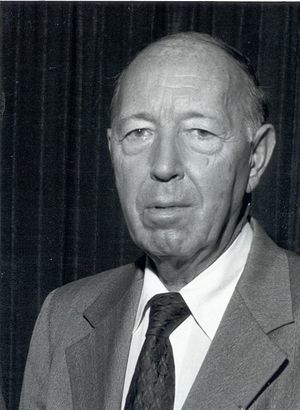 Over the course of his career at ITT, Busignies was granted 140 patents and developed inventions for the company including the MTI (Moving Target Indicator) Radar, originally used by the military, which became a standard at airports; the IFF (Identification - Friend or Foe) patent; bi-static and multi-static radars; doppler radio navigation systems; and many other radio systems. He became President of ITT Laboratories in 1955 and General Technical Director and Senior Vice President of ITT in 1960. He retired in 1975 but continued his activities with the company as Chief Scientist Emeritus. A Fellow of IEEE, Busignies received the IEEE Award in International Communication in honor of Hernand and Sosthènes Behn, the IEEE David Sarnoff Award and the Armstrong Medal, the highest honor of the Radio Club of America. He served as Chairman of Committees of the National Academy of Engineering (elected member in 1966), National Research Council, NATO Industrial Advisory Group. In the last decades of his life, Busignies traveled extensively, advising and lecturing on the applications of the latest techniques of telecommunications by satellite and cables, for data, computer applications, education, seeking to demonstrate the value of good and extended communication for peace and progress. In 1977 Dr. Busignies was awarded the IEEE Edison Medal "For technical contributions and leadership in the field of radar, radio communication and radio navigation." Rader, Louis T. "Henri Gaston Busignies: 1905-1981." Memorial Tributes, Volume 2. (Washington DC: National Academy of Engineering, 1984), 29. This page was last edited on 27 January 2016, at 20:05.